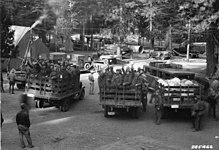 The Civilian Conservation Corps (CCC) was a public work relief program that operated from 1933 to 1942 in the United States for unemployed, unmarried men. Originally for young men ages 18–25, it was eventually expanded to ages 17–28. Robert Fechner was the first director of the agency, succeeded by James McEntee following Fechner's death. The CCC was a major part of President Franklin D. Roosevelt's New Deal that provided unskilled manual labor jobs related to the conservation and development of natural resources in rural lands owned by federal, state, and local governments. 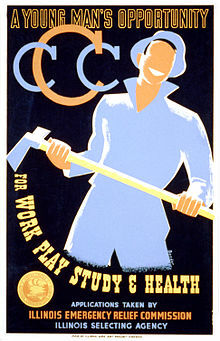 The CCC was designed to provide jobs for young men and to relieve families who had difficulty finding jobs during the Great Depression in the United States. Maximum enrollment at any one time was 300,000. Through the course of its nine years in operation, 3 million young men participated in the CCC, which provided them with shelter, clothing, and food, together with a wage of $30 (about $570 in 2017) per month ($25 of which had to be sent home to their families). By 1942, with World War II and the draft in operation, the need for work relief declined, and Congress voted to close the program. He promised this law would provide 250,000 young men with meals, housing, workwear, and medical care for working in the national forests and other government properties. The Emergency Conservation Work (ECW) Act was introduced to Congress the same day and enacted by voice vote on March 31. Roosevelt issued Executive Order 6101 on April 5, 1933, which established the CCC organization and appointed a director, Robert Fechner, a former labor union official who served until 1939. The organization and administration of the CCC was a new experiment in operations for a federal government agency. The order indicated that the program was to be supervised jointly by four government departments: Labor, which recruited the young men, War, which operated the camps, and Agriculture and Interior, which organized and supervised the work projects. A CCC Advisory Council was composed of a representative from each of the supervising departments. In addition, the Office of Education and Veterans Administration participated in the program. To end the opposition from labor unions (which wanted no training programs started when so many of their men were unemployed) Roosevelt chose Robert Fechner, vice president of the International Association of Machinists and Aerospace Workers, as director of the corps. William Green, head of the American Federation of Labor, was taken to the first camp to demonstrate that there would be no job training involved beyond simple manual labor. Reserve officers from the U.S. Army were in charge of the camps, but there was no military training. General Douglas MacArthur was placed in charge of the program but said that the number of Army officers and soldiers assigned to the camps was affecting the readiness of the Regular Army. But the Army also found numerous benefits in the program. When the draft began in 1940, the policy was to make CCC alumni corporals and sergeants. CCC also provided command experience to Organized Reserve Corps officers. Through the CCC, the Regular Army could assess the leadership performance of both Regular and Reserve Officers. The CCC provided lessons which the Army used in developing its wartime and mobilization plans for training camps. The legislation and mobilization of the program occurred quite rapidly. Roosevelt made his request to Congress on March 21, 1933; the legislation was submitted to Congress the same day; Congress passed it by voice vote on March 31; Roosevelt signed it the same day, then issued an executive order on April 5 creating the agency, appointing its director (Fechner), and assigning War Department corps area commanders to begin enrollment. The first CCC enrollee was selected April 8, and subsequent lists of unemployed men were supplied by state and local welfare and relief agencies for immediate enrollment. 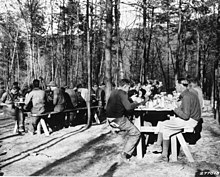 On April 17, the first camp, NF-1, Camp Roosevelt, was established at George Washington National Forest near Luray, Virginia. On June 18, the first of 161 soil erosion control camps was opened, in Clayton, Alabama. By July 1, 1933 there were 1,463 working camps with 250,000 junior enrollees (18–25 years of age); 28,000 veterans; 14,000 American Indians; and 25,000 Locally Enrolled (or Experienced) Men (LEM). Following the second Bonus Army march on Washington D.C., President Roosevelt amended the CCC program on May 11, 1933, to include work opportunities for veterans. Veteran qualifications differed from the junior enrollee; one needed to be certified by the Veterans Administration by an application. They could be any age, and married or single as long as they were in need of work. Veterans were generally assigned to entire veteran camps. Enrollees were eligible for the following "rated" positions to help with camp administration: senior leader, mess steward, storekeeper and two cooks; assistant leader, company clerk, assistant educational advisor and three second cooks. These men received additional pay ranging from $36 to $45 per month depending on their rating. The company organization of each camp had a dual-authority supervisory staff: firstly, Department of War personnel or Reserve officers (until July 1, 1939), a "company commander" and junior officer, who were responsible for overall camp operation, logistics, education and training; and secondly, ten to fourteen technical service civilians, including a camp "superintendent" and "foreman", employed by either the Departments of Interior or Agriculture, responsible for the particular fieldwork. Also included in camp operation were several non-technical supervisor LEMs, who provided knowledge of the work at hand, "lay of the land," and paternal guidance for inexperienced enrollees. Enrollees were organized into work detail units called "sections" of 25 men each, according to the barracks they resided in. Each section had an enrollee " senior leader" and "assistant leader" who were accountable for the men at work and in the barracks. Approximately 55% of enrollees were from rural communities, a majority of which were non-farm; 45% came from urban areas. Level of education for the enrollee averaged 3% illiterate; 38% had less than eight years of school; 48% did not complete high school; and 11% were high school graduates. At the time of entry, 70% of enrollees were malnourished and poorly clothed. Few had work experience beyond occasional odd jobs. Peace was maintained by the threat of "dishonorable discharge". "This is a training station; we're going to leave morally and physically fit to lick 'Old Man Depression,'" boasted the newsletter, Happy Days, of a North Carolina camp. Because of the power of the Solid South white Democrats in Congress, who insisted on racial segregation, the New Deal programs were racially segregated; blacks and whites rarely worked alongside each other. At this time, all the states of the South had passed legislation imposing racial segregation and, since the turn of the century, laws and constitutional provisions that disenfranchised most blacks; they were excluded from formal politics. Because of discrimination by white officials at the local and state levels, blacks in the South did not receive as many benefits as whites from New Deal programs. During 1933, about half the male heads of households on the Sioux reservations in South Dakota were employed by the CCC-ID. With grants from the Public Works Administration (PWA), the Indian Division built schools and conducted an extensive road-building program in and around many reservations to improve infrastructure. The mission was to reduce erosion and improve the value of Indian lands. Crews built dams of many types on creeks, then sowed grass on the eroded areas from which the damming materials had been taken. They built roads and planted shelter-belts on federal lands. The steady income helped participants regain self-respect, and many used the funds to improve their lives. John Collier, the federal Commissioner of Indian Affairs and Daniel Murphy, the director of the CCC-ID, both based the program on Indian self-rule and the restoration of tribal lands, governments, and cultures. The next year, Congress passed the Indian Reorganization Act of 1934, which ended allotments and helped preserve tribal lands, and encouraged tribes to re-establish self-government. Responding to favorable public opinion to alleviate unemployment, Congress approved the Emergency Relief Appropriation Act of 1935, on April 8, 1935, which included continued funding for the CCC program through March 31, 1937. The age limit was expanded to 18-28 to include more men. :11 From April 1, 1935 to March 31, 1936 was the period of greatest activity and work accomplished by the CCC program. Enrollment had peaked at 505,782 in about 2,900 camps by August 31, 1935, followed by a reduction to 350,000 enrollees in 2,019 camps by June 30, 1936. During this period the public response to the CCC program was overwhelmingly popular. A Gallup poll of April 18, 1936, asked: "Are you in favor of the CCC camps? "; 82% of respondents said yes, including 92% of Democrats and 67% of Republicans. 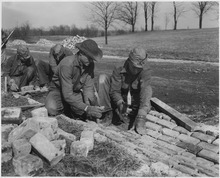 On June 28, 1937, the Civilian Conservation Corps was legally established and transferred from its original designation as the Emergency Conservation Work program. Funding was extended for three more years by Public Law No. 163, 75th Congress, effective July 1, 1937. Congress changed the age limits to 17–23 years old and changed the requirement that enrollees be on relief to "not regularly in attendance at school, or possessing full-time employment." The 1937 law mandated the inclusion of vocational and academic training for a minimum of 10 hours per week. Students in school were allowed to enroll during summer vacation. During this period, the CCC forces contributed to disaster relief following 1937 floods in New York, Vermont, and the Ohio and Mississippi river valleys, and response and clean-up after the 1938 hurricane in New England. In 1939 Congress ended the independent status of the CCC, transferring it to the control of the Federal Security Agency. The National Youth Administration, U.S. Employment Service, the Office of Education, and the Works Progress Administration also had some responsibilities. About 5,000 Reserve officers for the camps were affected, as they were transferred to federal Civil Service, and military ranks and titles were eliminated. Despite the loss of overt military leadership in the camps by July 1940, with war underway in Europe and Asia, the government directed an increasing number of CCC projects on resources for national defense. It developed infrastructure for military training facilities and forest protection. By 1940 the CCC was no longer wholly a relief agency, was rapidly losing its non-military character, and it was becoming a system for work-training, as its ranks had become increasingly younger, with little experience. Although the CCC was probably the most popular New Deal program, it never was authorized as a permanent agency. The program was reduced in scale as the Depression waned and employment opportunities improved. After conscription began in 1940, fewer eligible young men were available. Following the attack on Pearl Harbor in December 1941, the Roosevelt administration directed all federal programs to emphasize the war effort. Most CCC work, except for wildland firefighting, was shifted onto U.S. military bases to help with construction. The CCC disbanded one year earlier than planned, as the 77th United States Congress ceased funding it. Operations were formally concluded at the end of the federal fiscal year on June 30, 1942. The end of the CCC program and closing of the camps involved arrangements to leave the incomplete work projects in the best possible state, the separation of about 1,800 appointed employees, the transfer of CCC property to the War and Navy Departments and other agencies, and the preparation of final accountability records. Liquidation of the CCC was ordered by Congress by the Labor-Federal Security Appropriation Act (56 Stat. 569) on July 2, 1942; and virtually completed on June 30, 1943. Liquidation appropriations for the CCC continued through April 20, 1948. Some former CCC sites in good condition were reactivated from 1941 to 1947 as Civilian Public Service camps where conscientious objectors performed "work of national importance" as an alternative to military service. Other camps were used to hold Japanese, German and Italian Americans interned under the Western Defense Command's Enemy Alien Control Program, as well as Axis prisoners of war. Most of the Japanese American internment camps were built by the people held there. After the CCC disbanded, the federal agencies responsible for public lands organized their own seasonal fire crews, modeled after the CCC. These have performed a firefighting function formerly done by the CCC and provided the same sort of outdoor work experience for young people. Approximately 47 young men have died while in this line of duty. Lou and Helen Adams Civilian Conservation Corps Museum, Parker Dam State Park, Huston Township, Clearfield County, Pennsylvania. Pride of the Bowery (1940), the fourth movie in the East Side Kid series, is a movie about friendship, trouble, and boxing at a CCC camp. The American Experience PBS series showcased documentaries on American history; it portrayed the life in Civilian Conservation Corps in 2009, in the first episode of Season 22. The CCC program was never officially terminated. Congress provided funding for closing the remaining camps in 1942 with the equipment being reallocated. It became a model for conservation programs that were implemented in the period after World War II. Present-day corps are national, state, and local programs that engage primarily youth and young adults (ages 16–25) in community service, training, and educational activities. The nation's approximately 113 corps programs operate in 41 states and the District of Columbia. During 2004, they enrolled more than 23,000 young people. The Corps Network, known originally as the National Association of Service and Conservation Corps (NASCC), works to expand and enhance corps-type programs throughout the country. The Corps Network began in 1985 when the nation's first 24 Corps directors banded together to secure an advocate at the federal level and a repository of information on how best to start and manage a corps. Early financial assistance from the Ford, Hewlett and Mott Foundations was critical to establishing the association. Another similar program is the National Civilian Community Corps, part of the AmeriCorps program, a team-based national service program in which young adults ages 18–24 spend 10 months working for non-profit and government organizations. The CCC program became a model for the creation of team-based national service youth conservation programs such as the Student Conservation Association (SCA). The SCA, founded in 1959, is a nonprofit organization that offers conservation internships and summer trail crew opportunities to more than 4,000 people each year. The SCA mission is to build a new generation of conservation managers by inspiring lifelong stewardship of the environment and communities by engaging high school and college-age volunteers in hands-on service to the land. SCA program is active nationwide in the USA, including national and state parks, forests, wildlife refuges, seashores and historic sites. SCA National Headquarters is located in Charlestown, New Hampshire, with regional offices across the country. In 1976, Governor of California Jerry Brown established the California Conservation Corps. This program had many similar characteristics - residential centers, high expectations for participation, and emphasis on hard work on public lands. Young adults from different backgrounds were recruited for a term of one year. Corps members attended a training session called the Corpsmember Orientation Motivation Education and Training (COMET) program before being assigned to one of the various centers. Project work is also similar to the original CCC of the 1930s - work on public forests, state and federal parks. Established in 1995, Environmental Corps, now Texas Conservation Corps (TxCC), is an American YouthWorks program which allows youth, ages 17 to 28, to contribute to the restoration and preservation of parks and public lands in Texas. The only conservation corps in Texas, TxcC is a nonprofit corporation based in Austin, Texas, which serves the entire state. Their work ranges from disaster relief to trail building to habitat restoration. 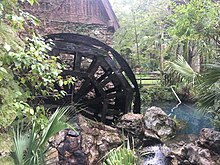 TxCC has done projects in national, state, and city parks. The Montana Conservation Corps (MCC) is a non-profit organization with a mission to equip young people with the skills and values to be vigorous citizens who improve their communities and environment. Collectively, MCC crews contribute more than 90,000 work hours each year. The MCC was established in 1991 by Montana's Human Resource Development Councils in Billings, Bozeman and Kalispell. Originally, it was a summer program for disadvantaged youth, although it has grown into an AmeriCorps-sponsored non-profit organization with six regional offices that serve Montana, Idaho, Wyoming, North Dakota, and South Dakota. All regions also offer Montana YES (Youth Engaged in Service) summer programs for teenagers who are 14 to 17 years old. The Washington Conservation Corps (WCC) is a sub-agency of the Washington State Department of Ecology. It employs men and women 18 to 25 years old in a program to protect and enhance Washington's natural resources. WCC is a part of the AmeriCorps program. Conservation Legacy is a non-profit employment, job training, and education organization with locations across the United States including Arizona Conservation Corps in Tucson and Flagstaff, Arizona; Southwest Conservation Corps in Durango and Salida, Colorado; and Southeast Conservation Corps in Chattanooga, Tennessee. Conservation Legacy also operates an AmeriCorps VISTA team serving to improve the environment and economies of historic mining communities in the American West and Appalachia. Conservation Legacy also hosts the Environmental Stewards Program - providing internships with federal, state, municipal and NGO land management agencies nationwide. Conservation Legacy formed as a merger of the Southwest Youth Corps, San Luis Valley Youth Corps, The Youth Corps of Southern Arizona, and Coconino Rural Environmental Corps. The Sea Ranger Service is a social enterprise, based in The Netherlands, which has taken its inspiration from the Civilian Conservation Corps in running a permanent youth training program, supported by veterans, to manage ocean areas and carry out underwater landscape restoration. Unemployed youths are trained up as Sea Rangers during a bootcamp and subsequently offered full-time employment to manage and regenerate Marine Protected Areas and aid ocean conservation. The Sea Ranger Service works in close cooperation with the Dutch government and national maritime authorities. ^ "Timeline . The Civilian Conservation Corps. American Experience. WGBH - PBS". American Experience. ^ "Inflation Calculator: Bureau of Labor Statistics". www.bls.gov. Retrieved January 4, 2016. ^ Rosentreter, Roger L. "Roosevelt's Tree Army". Michigan History Magazine. ^ "Camp Roosevelt, NF-1". Archived from the original on December 1, 2008. ^ "Timeline. Surviving the Dust Bowl. American Experience . WGBH - PBS". Retrieved March 2, 2012. ^ a b c Fechner, Robert, Director (1938). Pamphlet: Objectives and Results of the Civilian Conservation Corps Program. Washington, D.C: Civilian Conservation Corps. ^ Kay Rippelmeyer (2015). The Civilian Conservation Corps in Southern Illinois, 1933-1942. Southern Illinois Press. pp. 98–99. 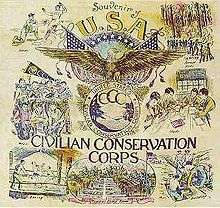 ^ "Civilian Conservation Corps (CCC)". www.u-s-history.com. Retrieved 2019-02-22. ^ "Civilian Conservation Corps". Densho Encyclopedia. Retrieved August 19, 2016. ^ "CCC Statues". National New Deal Preservation Association. Archived from the original on June 14, 2008. Retrieved August 19, 2016. ^ jtf87. "American Experience (TV Series 1988– )". IMDb. ^ dimplet (November 2, 2009). ""American Experience" Civilian Conservation Corps (TV Episode 2009)". IMDb. ^ "Another Author: Book Review: HITCH - Making Good In Hard Times". Becomingprince.blogspot.com. February 19, 2012. Retrieved August 19, 2016. .
^ "Timeline. The Civilian Conservation Corps. American Experience. WGBH - PBS". American Experience. ^ "Home - Conservation Legacy". ^ "Unemployed Dutch youth become sea rangers to protect marine life". Apolitical. Retrieved 2019-02-23. Wikimedia Commons has media related to Civilian Conservation Corps. Encyclopedia of Oklahoma History and Culture, "Civilian Conservation Corps"
Henderson, James D. Lost in the Woods–The Legacy of CCC Camp Pelican, (2009). Siuslaw National Forest; History Department; Portland State University. "Camp 56: An Oral History Project: World War II Conscientious Objectors and the Waldport, Oregon Civilian Public Service Camp" (PDF). Center for Columbia River History. Archived from the original (PDF) on June 4, 2013. Retrieved August 15, 2013. Images of the Civilian Conservation Corps on the Oregon State University Archives Flickr Commons page. CNY Heritage Digital Library, featuring images of Civilian Conservation Corps members constructing Green Lakes State Park in Central New York (1929–1948).